I've finally finished my bedroom...for now, at least! With the sewing of simple curtains for the windows, the room has a completed look and is everything I wanted it to be. Eventually, I will probably do something different for the bed, but it's a long way off. I have a quilt that I started years ago that needs its handquilting done. 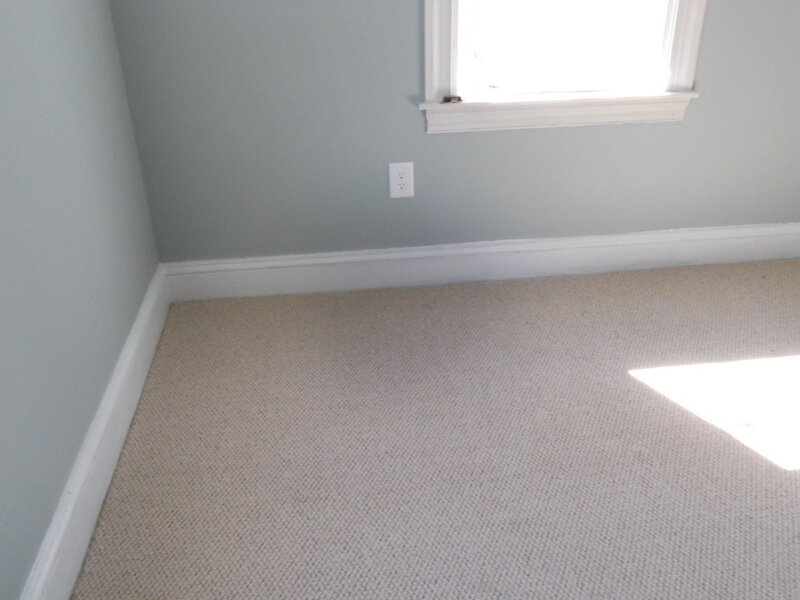 It will be perfect in here and I may do some pillow shams to match, but there are a lot of things that will come ahead of that, so I'm pronouncing this room DONE! I've been working on hemming pants for my husband and before that I made some cloth napkins and coasters for my daughter. I also made a very simple topper for my kitchen window, but it doesn't lend itself to being photographed, because of the way the sun comes through from behind it. Next on my list is curtains for my living room. There are some cheap ones there that were always meant to be temporary. I have some linen that I've been hoarding, but I don't think I have enough of one color to do the full length curtains I have in mind, so I'm trying to figure out an alternative. I have recently been having a great time doing groupings of collectables on my walls for decor, rather than pictures. 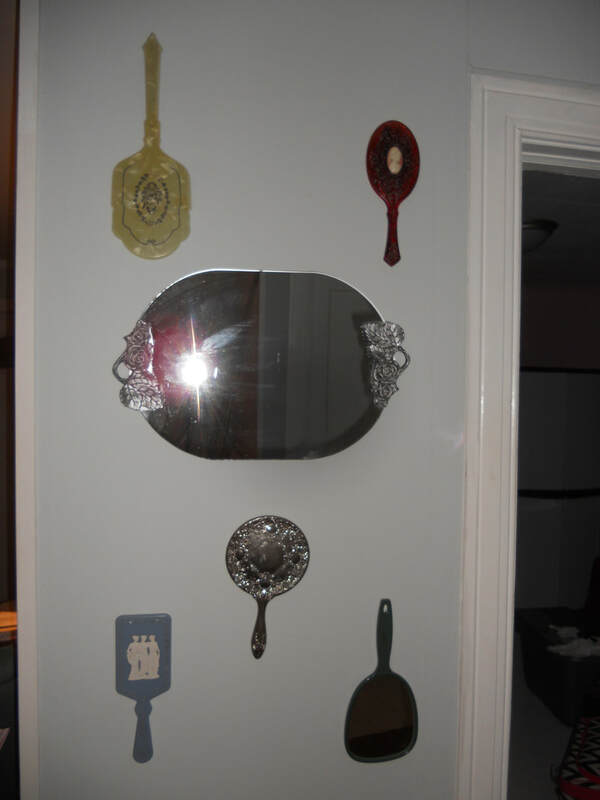 The first one is a group of hand mirrors on a narrow wall near my dining area. These were collected over a period of time, with lots of help from my niece, who gets to thrift stores more often than I do. Thanks Sandy Jean! The large piece in the center was actually a vanity tray I found for $1.00! 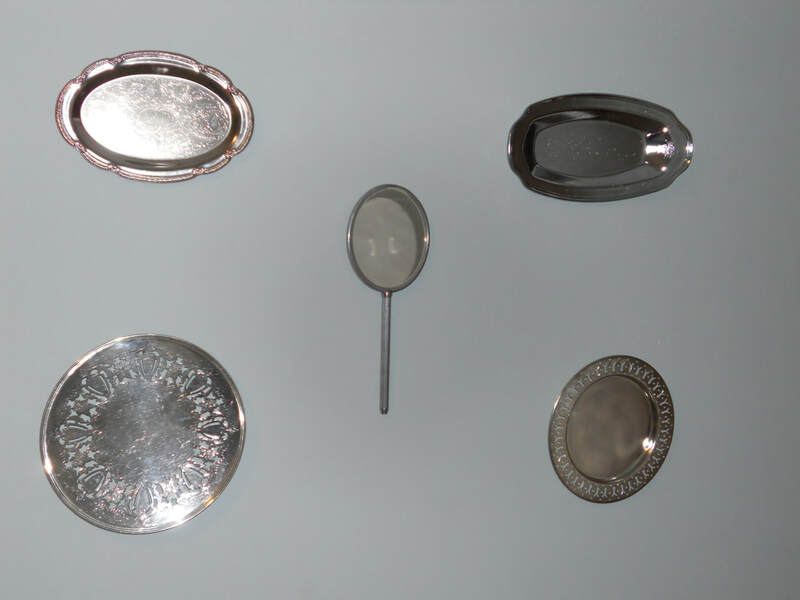 The next photo shows a grouping of silver trays (with another hand mirror) on one of my bedroom walls. Again these were inexpensive thrift store finds. They add a little sparkle to my walls in the silver blue room. 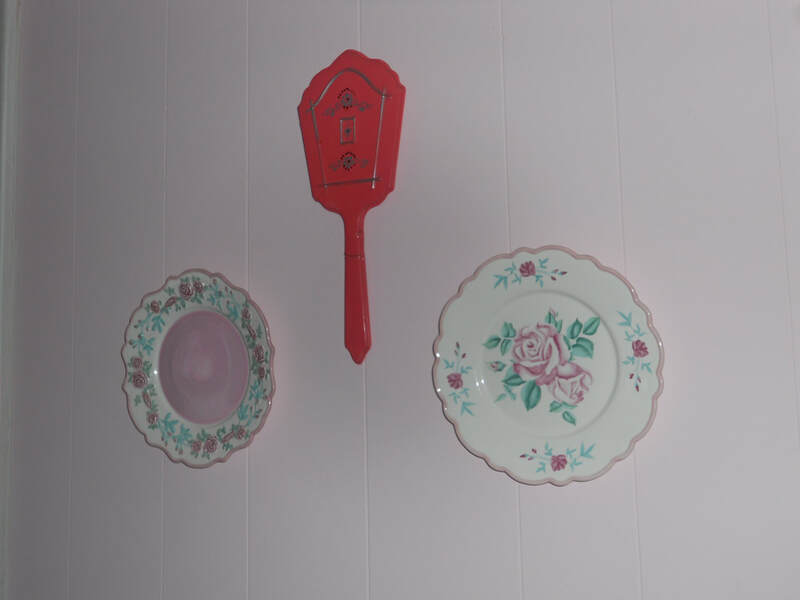 There is a very small grouping with two luncheon plates and one hand mirror in my sewing room. Finally, a grouping of plates in the dining area. It gives me a lot of pleasure to have these unique collections on my walls. They were not expensive, and they took more time and thought than hanging pictures, but it was a great way to express my own tastes. 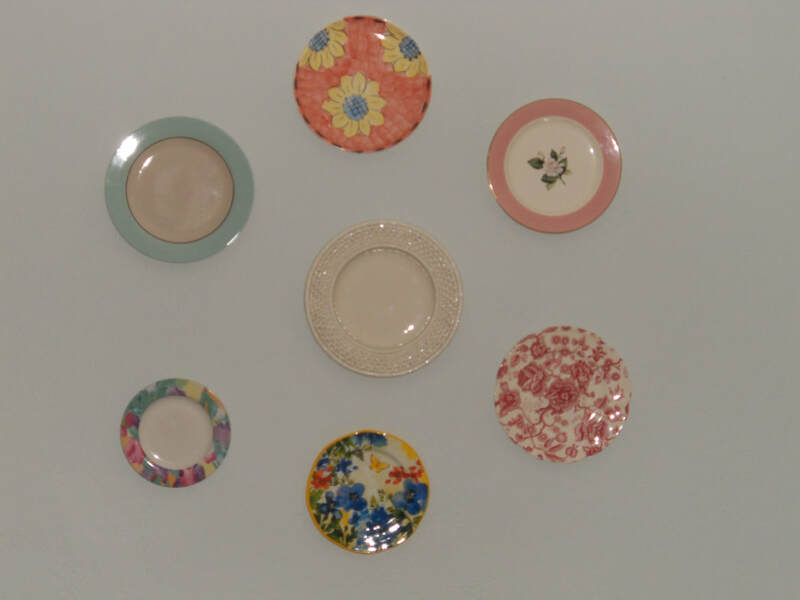 Most of the plates have a single "flip top" from a soda can glued with E6000 glue to the back. I bent the flip tops somewhat to make them easier to hook over the picture hanger hooks in the wall. I few of the heaviest ones have two flip tops connected by picture wire to help divide the weight. The vanity tray is totally hung by heavy duty wire which is wrapped around the flower decoration on the edges and virtually invisible from the front. I used picture hanging hooks on the wall, the type being chosen by how heavy the plate was. These were very satisfyiing projects and I'm so glad I made the extra effort to do them! Some new photos, at last! 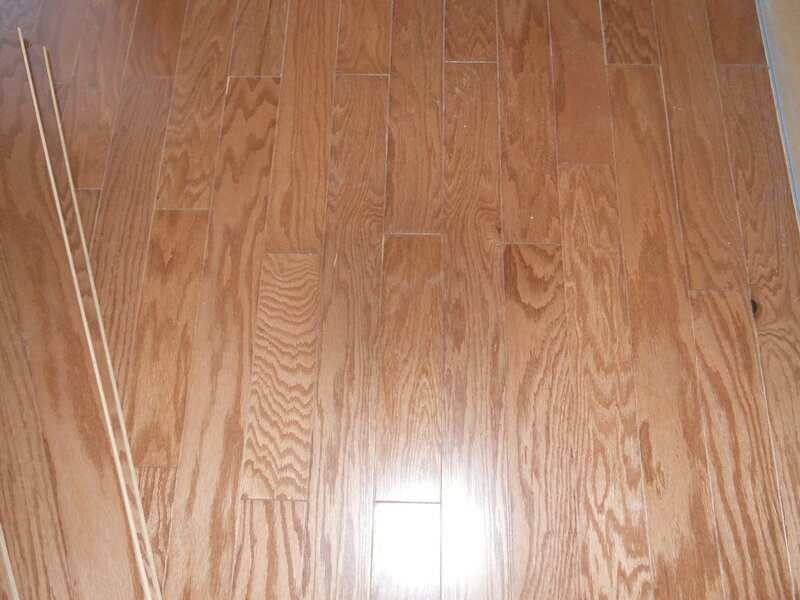 Above pic is pretty much how it looks entering the front door and slightly to the right. Inside the room, facing front of house. 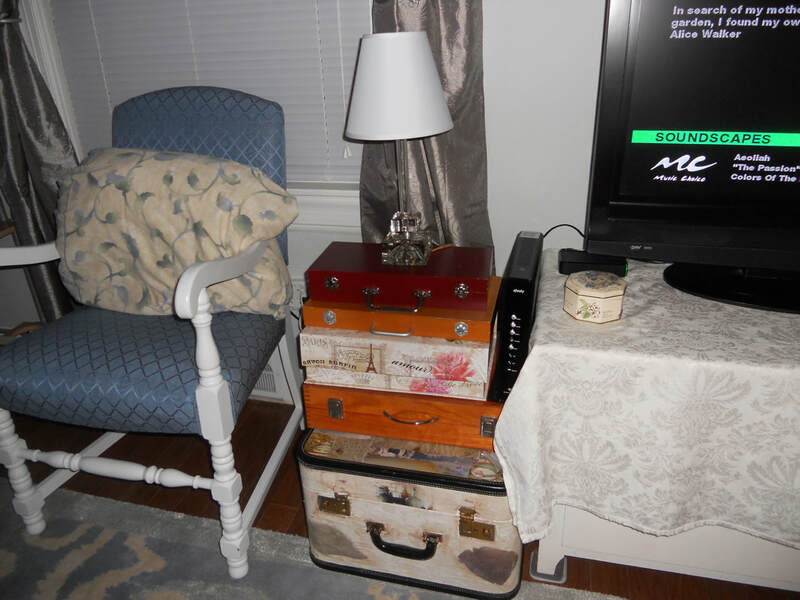 Blue and white chair is a beloved family heirloom, the stacked boxes are old suitcases, new boxes and wooden boxes with art supplies in them. Yard sale lamp. 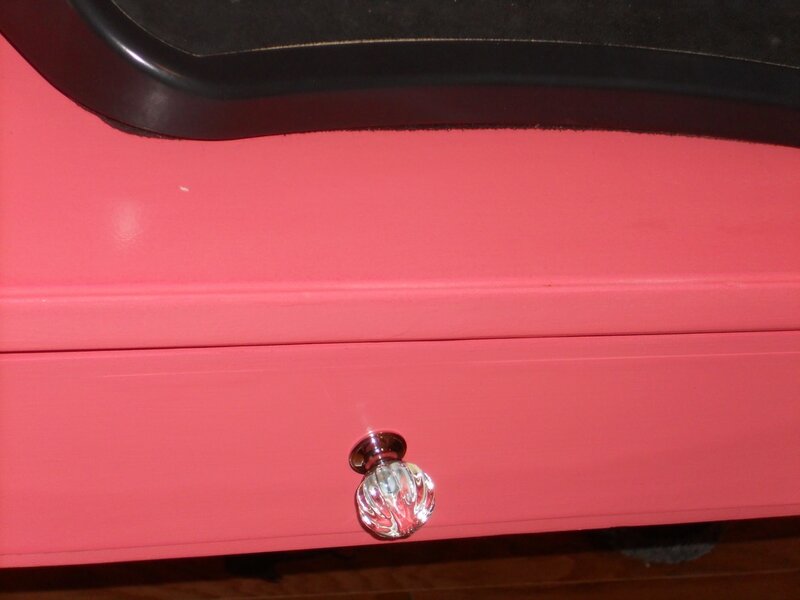 The cloth covered dresser that holds the t.v. has drawers that hold DVD's and such (the lamp will help me find the one I want!) and it's covered for only one reason. 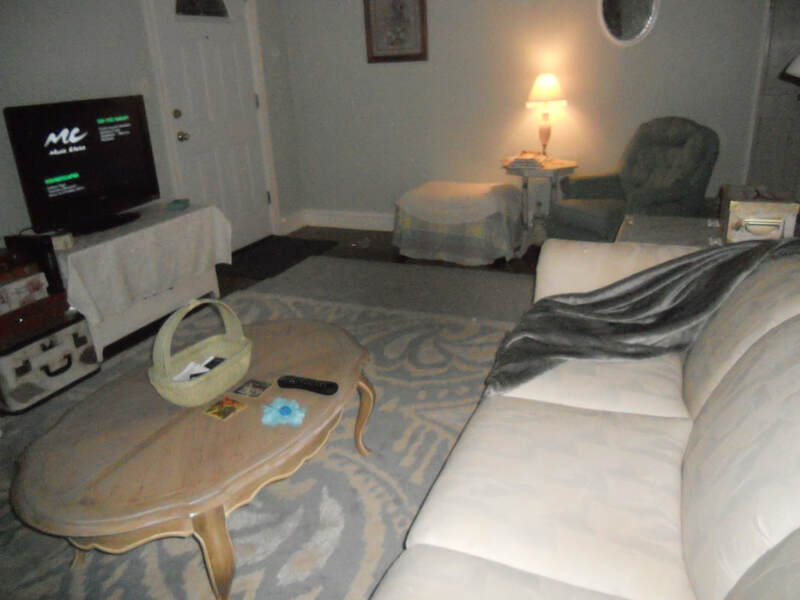 It was probably owned by a young girl and there are glittery words decaled on, such as "Dream" and "Peace," which are fine in their place, but wrong for my grown up living room. If I remove them I need to be ready to repaint the dresser and I'm not right now, so they're covered. 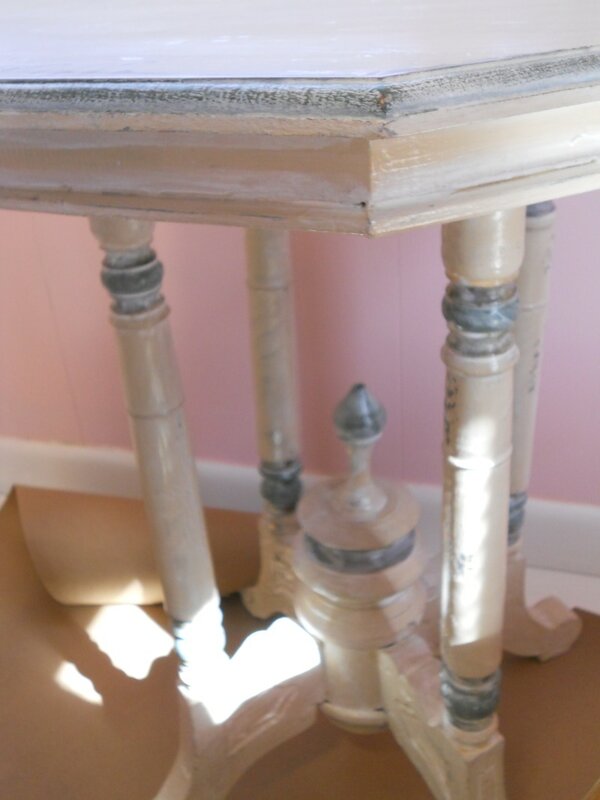 You might recall this little odd table in my paint projects from last fall. It just works here. I can still see the tv and the light is good for sewing, though I have also added a reading lamp behind one end of the sofa, so that works, too. 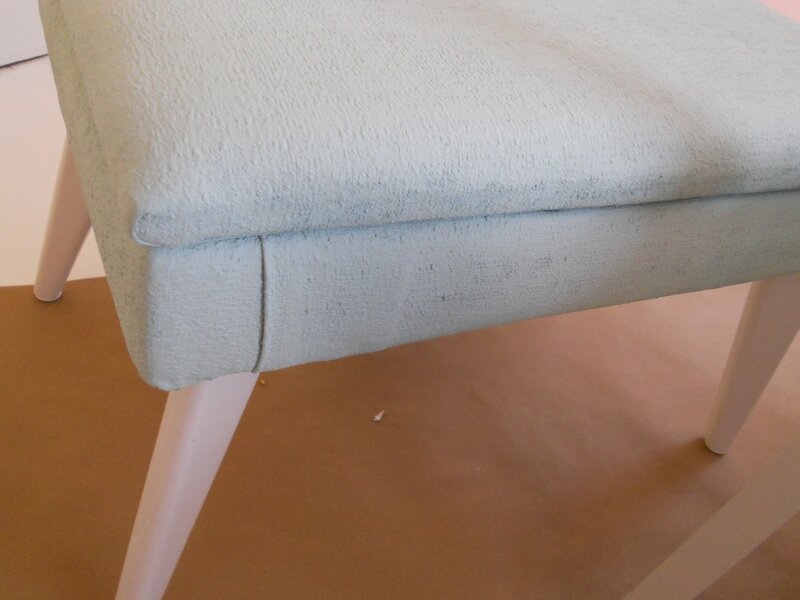 The ottoman is actually very soft and comfy and serves at least three possible purposes. It is a good place to sit and take off messy shoes before venturing in on a rainy night. It also serves as extra guest seating if needed. 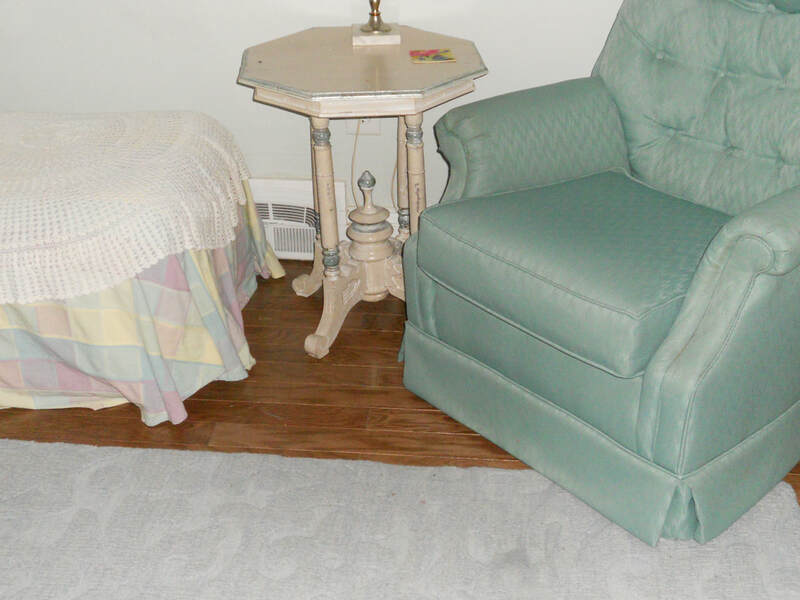 In a pinch, I could also set a tray on here for drinks or snacks and place it wherever needed in this room. It needs a new cover (the actual fabric is just too dark for this room) and I will get to that when I decide...too many choices available right now and it's not a priority. This is pretty much the view from the dining room/open hall. And now I offer you some BONUS pictures. This first one is the beginning of what I'm doing on a narrow wall between the living room and my sewing room. There will be several more mirrors here when I'm done.This is some of what I was talking about in my last post. Above is what the backs of plates and mirrors look like awaiting their chance to be hung on the wall. Flip tops from cans serving as hangers. 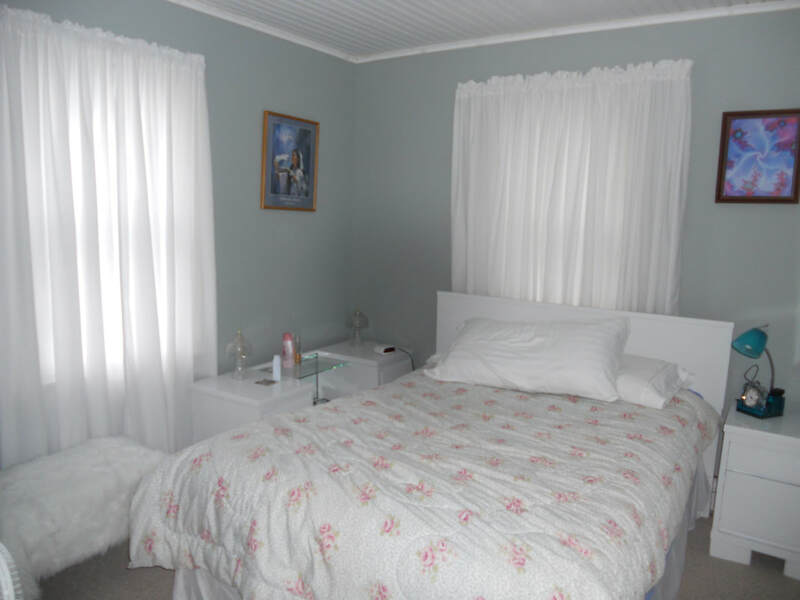 And finally, a sneak peak at the bedroom. I really want to get curtains up in here before posting, but couldn't resist a couple, not showing the boring window blinds. I'm very comfortable and happy in this room! It's JUST big enough for me. iI took off the closet door to give more room in here. 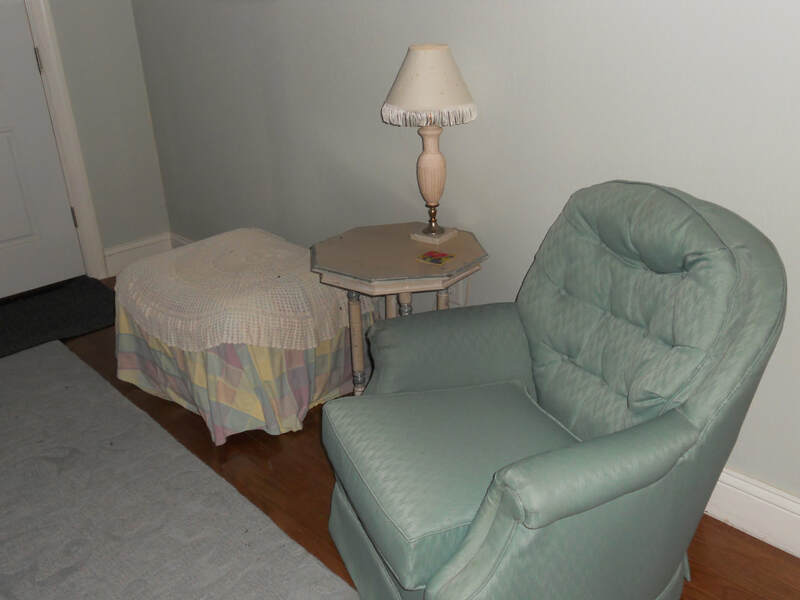 Without having to worry about the door swinging open, I had room for the fuzzy little seat and more room to maneuver around the end of my bed at night when I'm half awake and in semi-darkness. I have most of my clothes in the vanity, the small chest showing here (another yard sale find, along with the lamp) and hanging one way or another in the closet. It works. So that's where it stands at the moment. 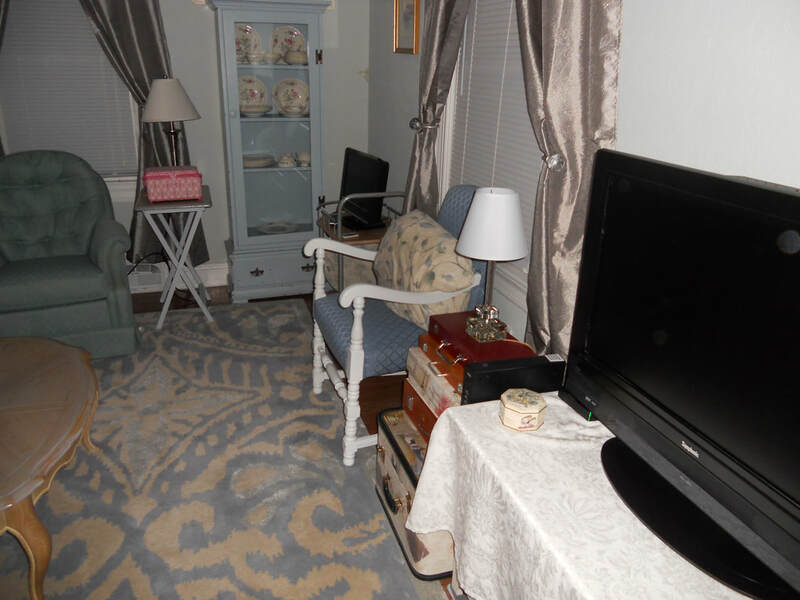 The living room just needs different curtains and I plan to make some very soft, comfy toss pillows. 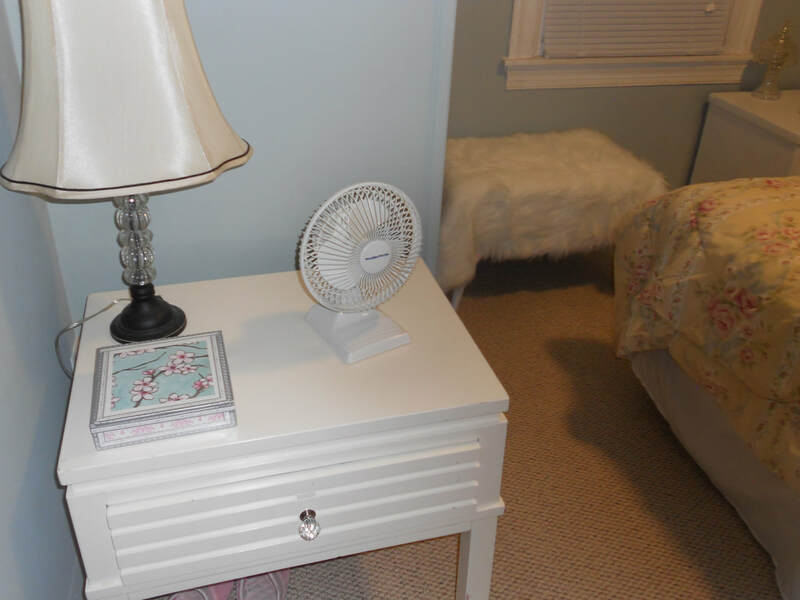 I wanted this room to be soft and pastel, but not ruffly and frou-frou. 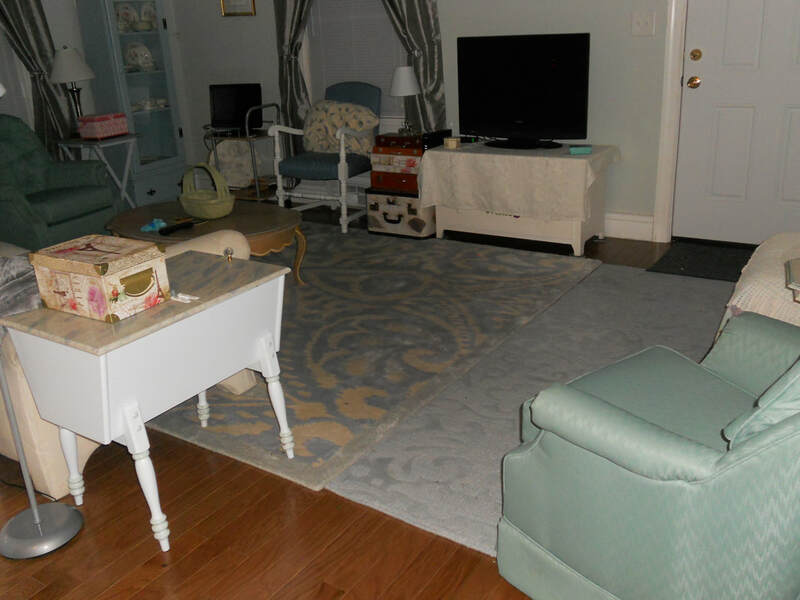 There is no lace, no ruffles, not a lot of extra "stuff," nor flowers everywhere, so it doesn't really qualify as "shabby chic" but is my own version of shabby, eclectic and soft. The bedroom is done except for curtains and some more wall decor. That's the room that will get the silver trays I mentioned previously. More photos when it's done. My sewing room still isn't totally "stocked" from the other house, but I'm in the process. My computer/art room is also a work in progress, waiting for a bookshelf for my cookbooks and a glass front cabinet that houses my CD player. I'll update with photos eventually as I complete these things. The kitchen has had nothing done and is waiting till fall for a major overhall, along with the purple utility room. 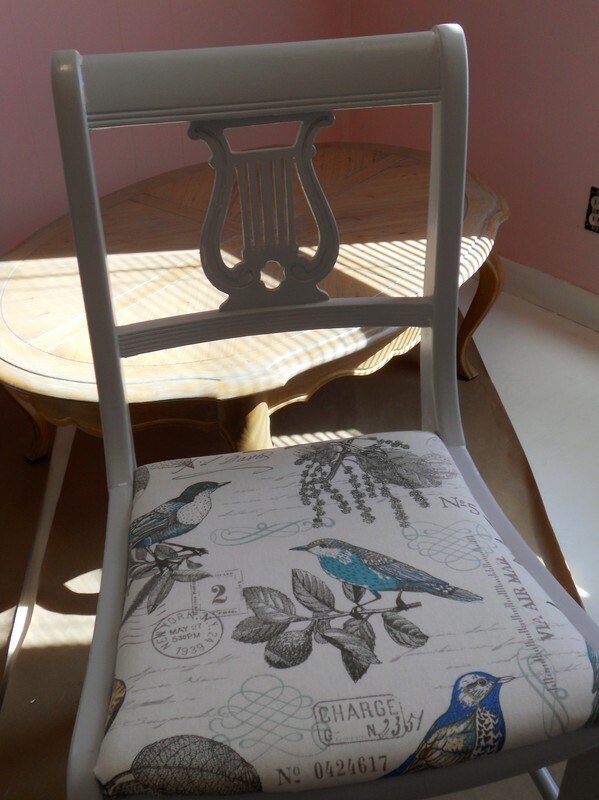 The dining area has a cheap folding table being used with my nicely redone chairs. This a makeshift situationj till I get my dining table painted (when the weather is cooler.) This table can comfortably seat four, so that is my entertaining limit for meals. It will all get there eventually, but for now, I'm living quite comfortably and peacefully in my little cottage. No, I did not drop off the face of the earth, just busy trying to settle in. I reached a point of exhaustion and gave myself a break for awhile, but now I'm trying hard to get the rest of my sewing things here and do some wall decor, as well as making some curtains. I did get some sewing done that I had promised my daughter many months ago. I felt that I should do that first. I am working on creative wall decor for three different areas. 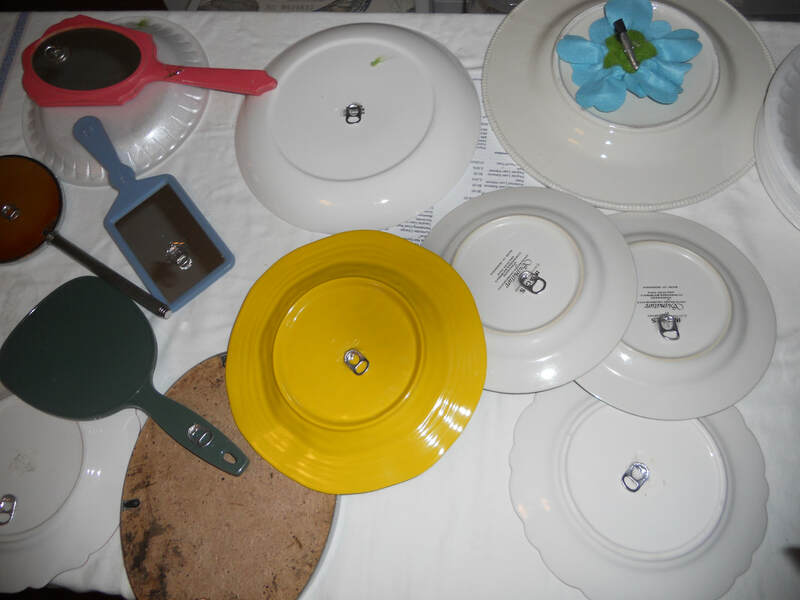 I'm going to place some beautiful plates that I've collected over the years on the dining room wall and am attempting a new method I saw on Pinterest (yeah, I know, I know.) You use a good glue,(in this case E6000) and attach metal flip top rings from soda or beer cans. I found I needed to bend them a little first, to make a good "hook." These take 24 hours to dry well. I'm mostly using standard picture hangers (the nail inside the hook type) to hang them on the wall. I still have some of those glued things drying till tomorrow and will start hanging these tomorrow to cover a dining room wall. I expect to do a lot of "fiddling" to get these to look right, so I need to be in the right mood and not in a hurry. I am also working on a wall that is tall and narrow in a hallway and I have placed one lovely mirror that was originally a dresser tray. 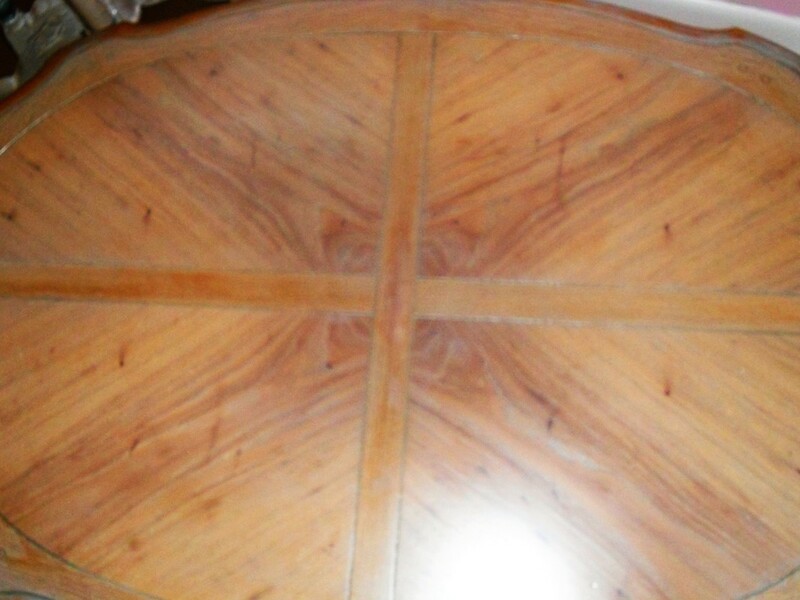 It has beautiful metal "carvings" on each end of an oval shape. Above and below that I'm placing a collection of hand mirrors, mostly picked up from local thrift stores (with the help of my niece.) Some of these are pretty and will be placed so you see the designs on the back. The ones that are really simple will be flipped over so you will see the mirror. 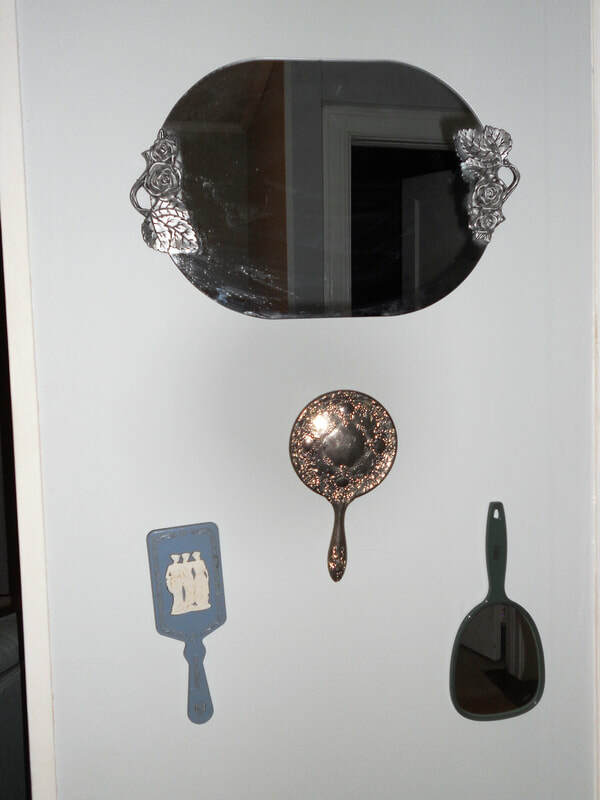 I also have a couple of small plates and a mirror to place in my sewing room, using this same method. The other part of the wall decor project is a collection of silver/silverplate trays that will be placed on the blank wall coming into my bedroom. I expect this to be very simple and straightforward, but really stunning when it's done. I promise photos from all these when they're done, but in the meantime, tomorrow I will at least get some of my livingroom, which is basically done for now. I have cheap curtains hanging that I really do not like and will replace those when I can, but at least the room looks finished. Hopefully, I'll be back on here tomorrow night with those photos. I've been in my house nearly four weeks and still don't have art on my walls, nor do I have any part of my entire sewing room. I'm aiming for both of those things this week! I feel like I'm still in limbo without my sewing stuff. My kitchen is quite functional, despite being quite ugly. I have almost everything here I think I need for mealmaking. If I decide I need more, I'll go get it. :) I'm not taking anymore photos until I have some wall decor up. I just refuse. To get to the point, finally, I had a nightmare with a new theme last night. I've often thought about having a career as a professional baker and was truly intrigued some time back about Panera Bread's information (on their website) concerning how they train their bakers. I am too old to handle the change in lifestyle (up in the middle of the night to bake the goodies) and my back and feet could never take the grueling hours on my feet. But last night I dreamed that I went into some old time bakery where they had really old fashioned ovens and baked simple bread. The owner was tired and couldn't keep up and I offered to take over for awhile to show him why he needed to hire me as an assistant baker. Immediately I got slammed with customers and couldn't keep up with the baking and I.burned.every.single.thing! He told me he couldn't use me and I was so very disappointed. I was all out of breath from my efforts, totally full of anxiety and crying from disappointment, and that's how I woke up. Sheesh. Way to take ruin a lovely fantasy! ​I will be back soon with photos, I promise. This was a FREE desk we found when a local motel was redecorating and they put a bunch of furniture out by their dumpster, free for anyone for the taking. I also got those great "barrel" chairs that I painted from there. This stuff is made to last and last. 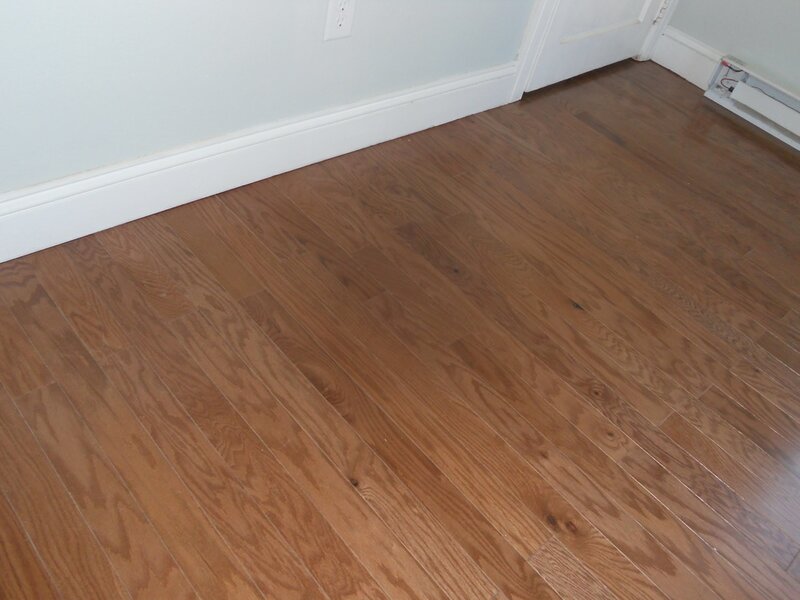 These are laminate topped, but take the paint really well after a light sanding to scuff it. I used Behr's Paint and Primer in a semi gloss. 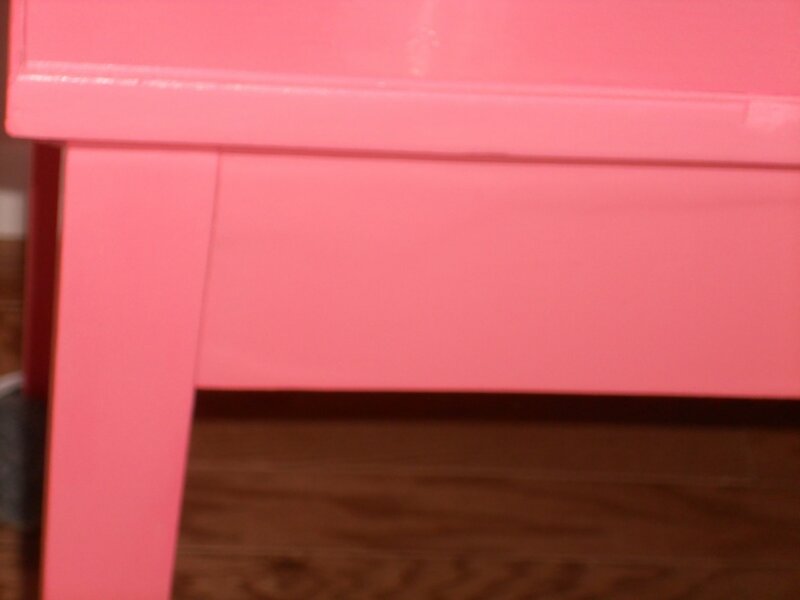 It took two coats on the legs and body, sanding lightly in between, but I added a topcoat of clear high gloss on top, because I wanted the extra shine and durability. I also replaced a very plain knob with this pretty one. 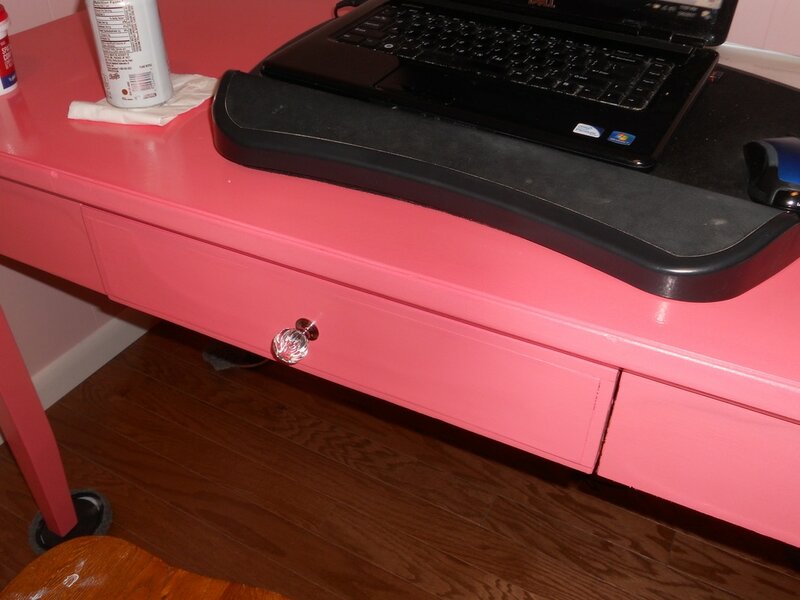 This desk is the perfect size for my laptop and a printer and the drawer is handy for a few simple office supplies. Aside from finishing up SO much stuff in the house, there is still the matter of a dining room table that I haven't painted. I have to somehow make time in the next week or so to get that sanded and painted, so I can have a place to eat with a guest or two. I'd love to invite people over to see the house when I get the bulk of things done. Can't wait! I am gradually moving into my house. Some large and small items are there, but lots still needs to move...it's just a matter of finding help. I plan to spend my first night in the house tonight. 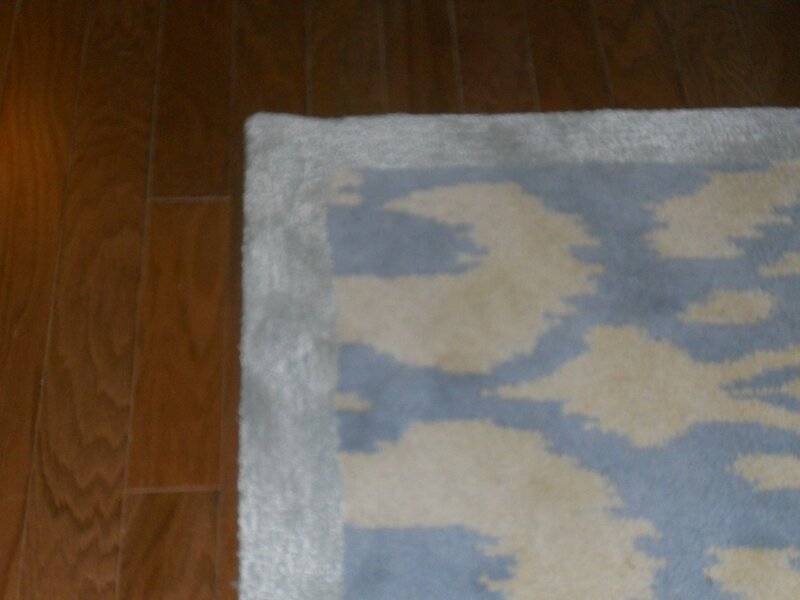 Here's a sneak peak at my area rug. I love it so much! It's an 8' x 11' and it makes me smile every time I see it. More to come soon. Busy, busy, busy! Going to make this a very short post, verbally. 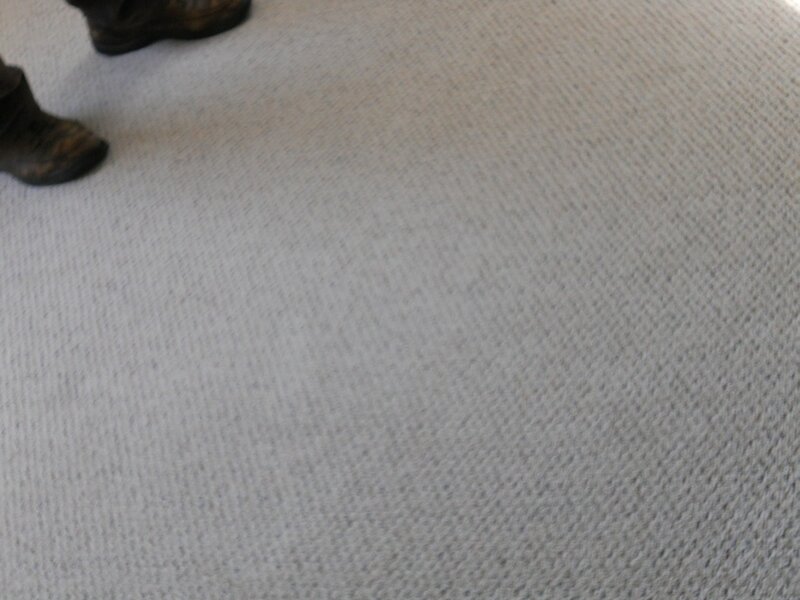 The carpet was put in my bedroom today, which was the last major thing that needed doing. The rest is just little stuff, so I hope to be moving around the weekend of 22-23d. 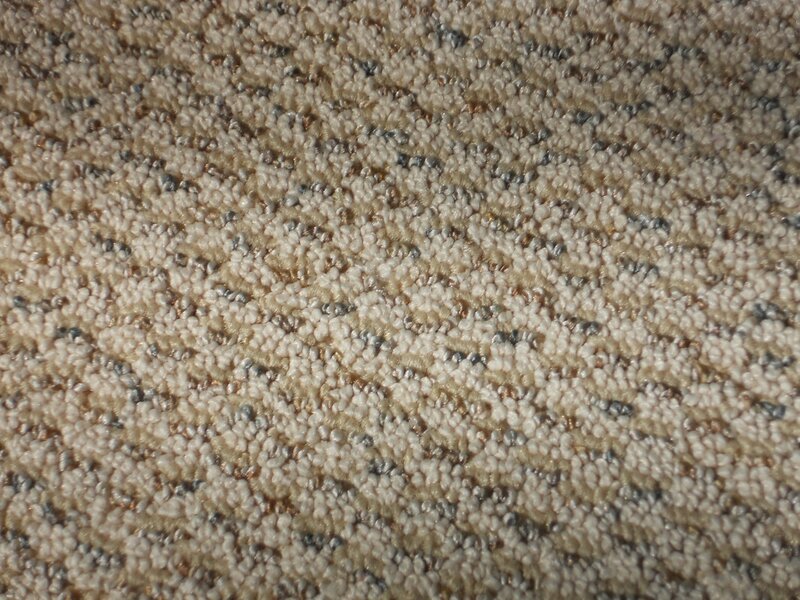 I didn't pick this carpet; it was a freebie from a generous family member and I didn't even know what it looked like till yesterday, when it was delivered. 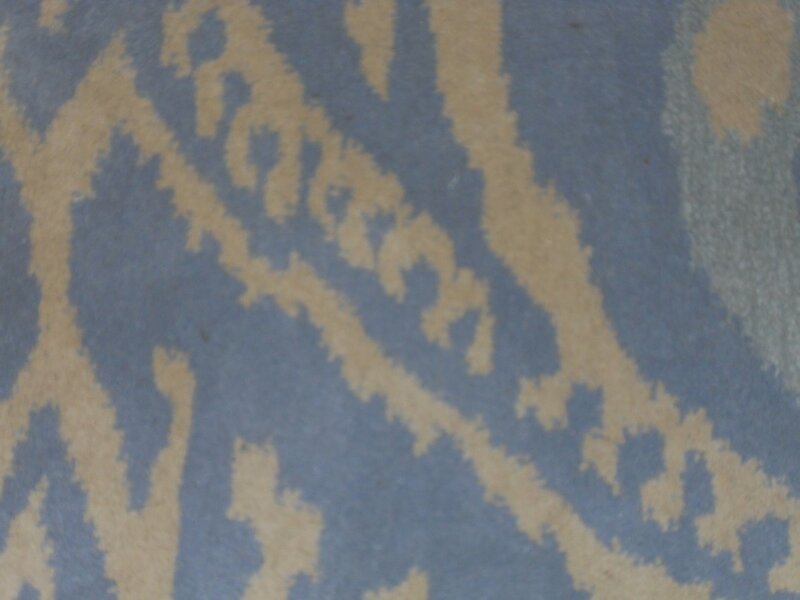 It's a very good quality berber in very neutral and light colors and just a little bit of blue-grey---PERFECT with my silver blue walls.. I couldn't have chosen better if I'd gone and picked it out myself! 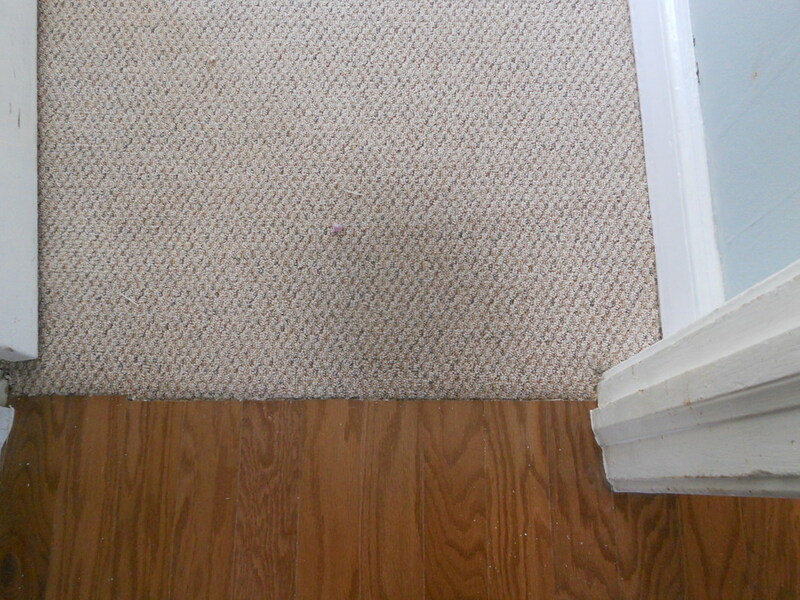 Matching wooden threshold strip goes across here to cover the carpet/wood floor join. 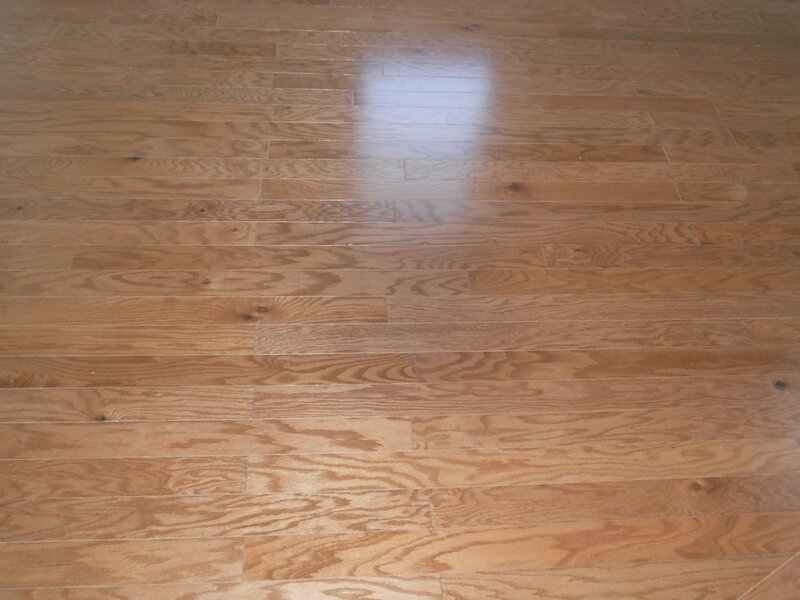 The hardwood flooring is about half done, so I got some photos today. 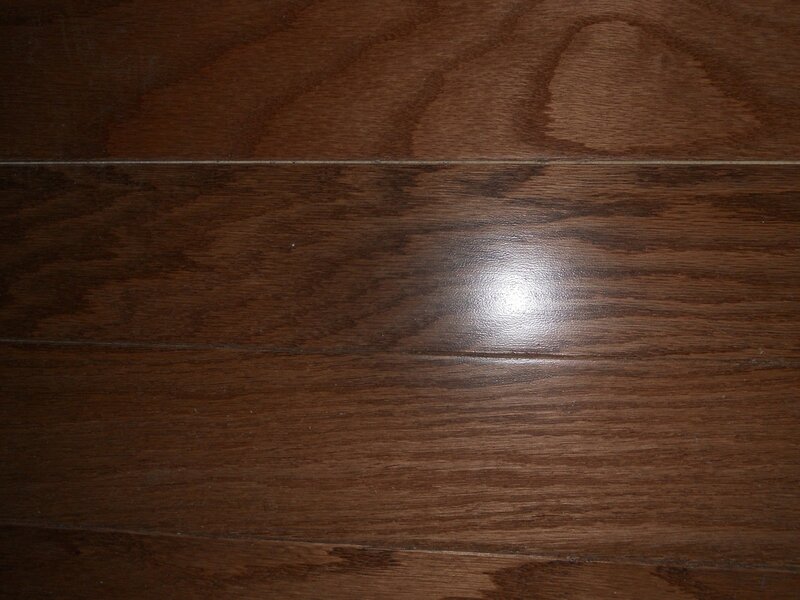 This is called "Walnut Oak" but it is actually red oak lightly stained with walnut. It takes out most of the red, so that overall, IRL it just looks like cocoa. 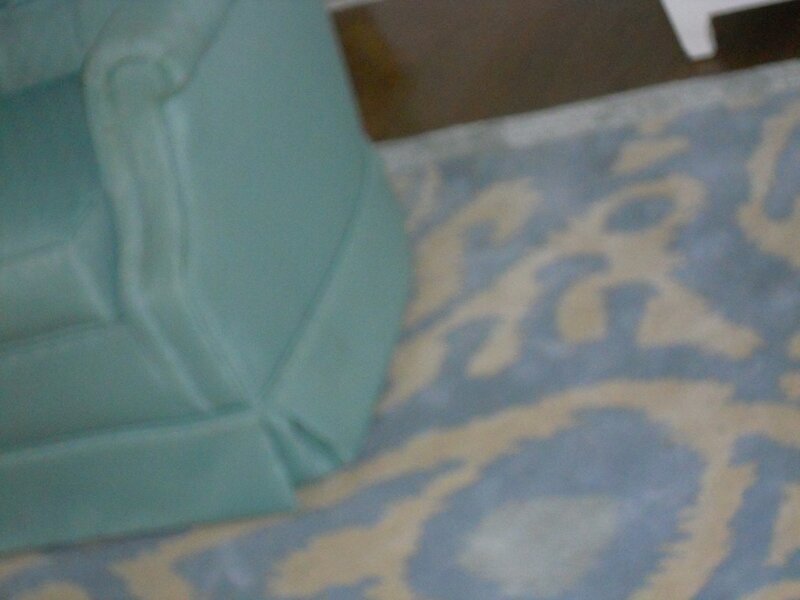 It's a nice medium tone that will go well with my furnishings. Jim has a few more days off before he goes back to work at his "paying" job, so we hope he'll get this done by the end of this week. I'm so excited! As many of you know, I've been away for over three weeks helping my daughter recover from some knee surgery, but I am back and ready to start working on the house again. I realize I'm way behind on photos, so let's see what I can do about that. 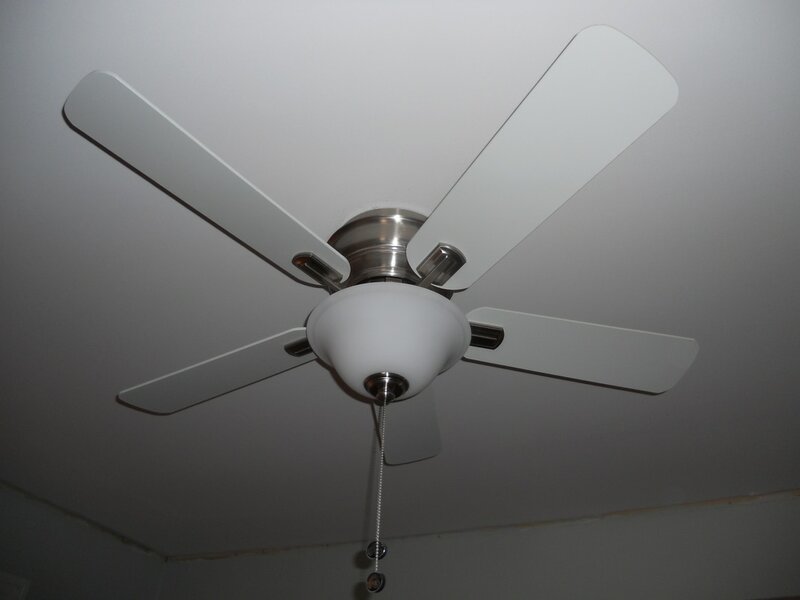 I know I didn't show you photos of my new fan/light. I purposely chose white and simple for this room, because I just want it to blend with the ceiling as much as possible. 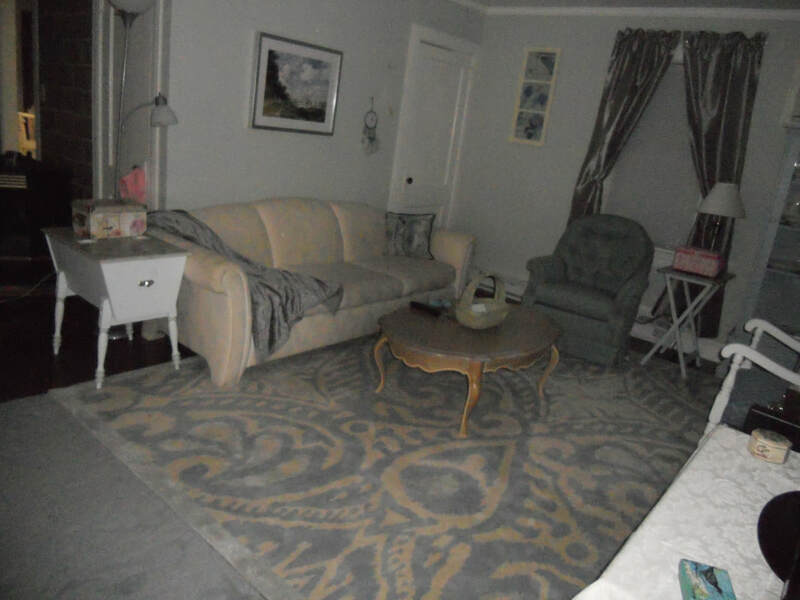 This room will have plenty of pretty things to catch your eye. 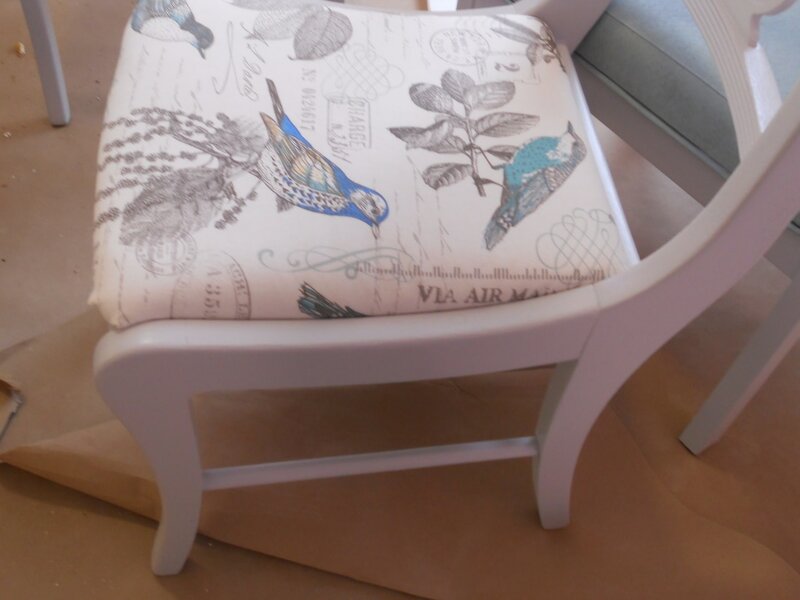 Also, I FINALLY got the seats recovered on my four grey painted chairs. These chairs were ugly, dark wood with dark embroidered seats. They really make me happy now. 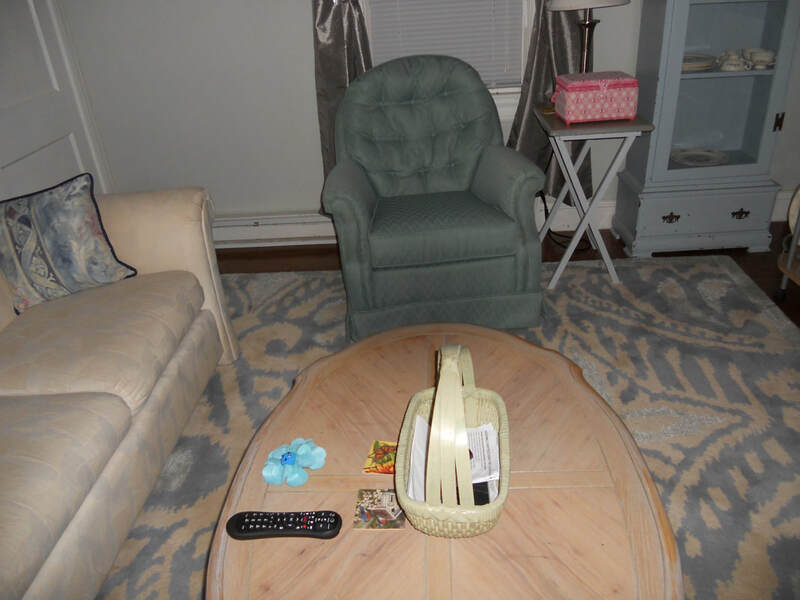 The table behind the chair is my coffee table. 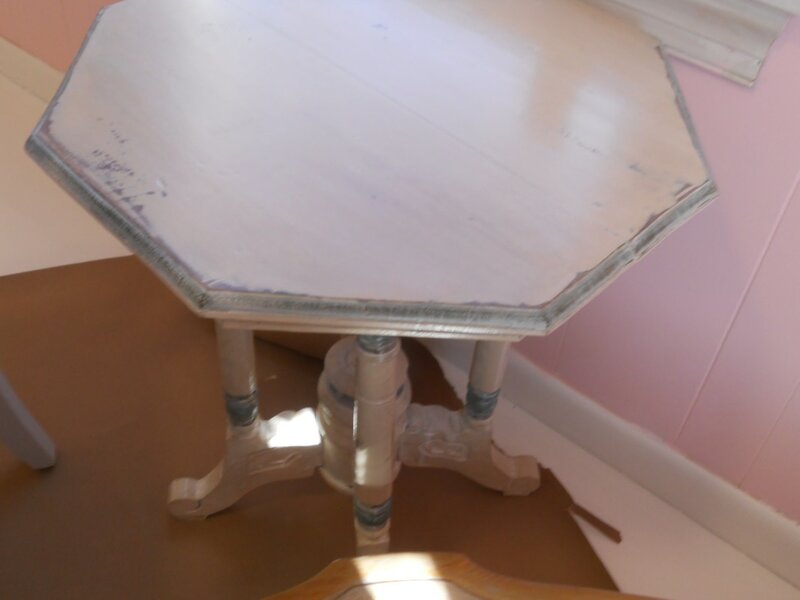 This table was so perfect, all I did was sand and whitewash the top and give it several coats of water-base poly. Looks fantastic. Will show you a closeup of the top shortly. I can't take too much credit for this little side table, since it was already elaborately painted and quite distressed when I bought it. All I did was a light sanding and some whitewashing to tone it down some. Also several coats of satin poly for durability and a light sheen. 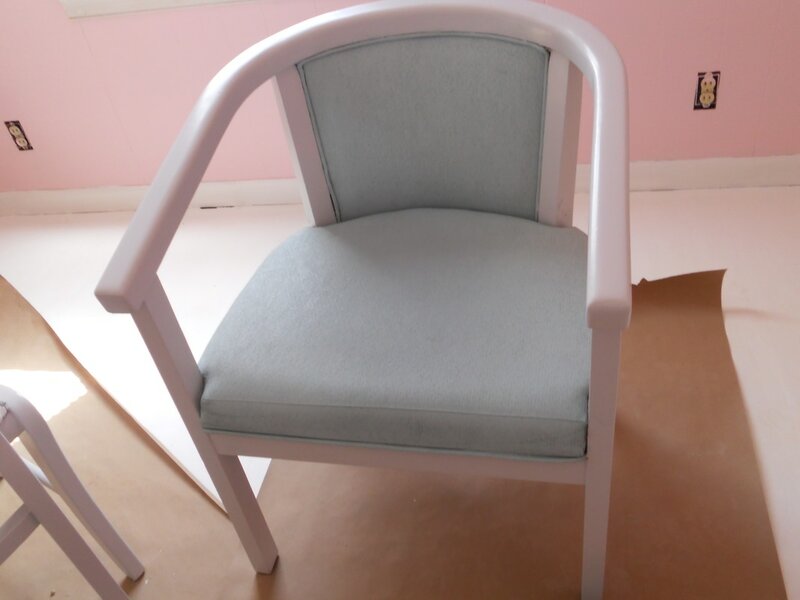 In case you forgot the other two chairs I did, they look like this. This last photo is the bench that goes with my mothers now-white vanity. 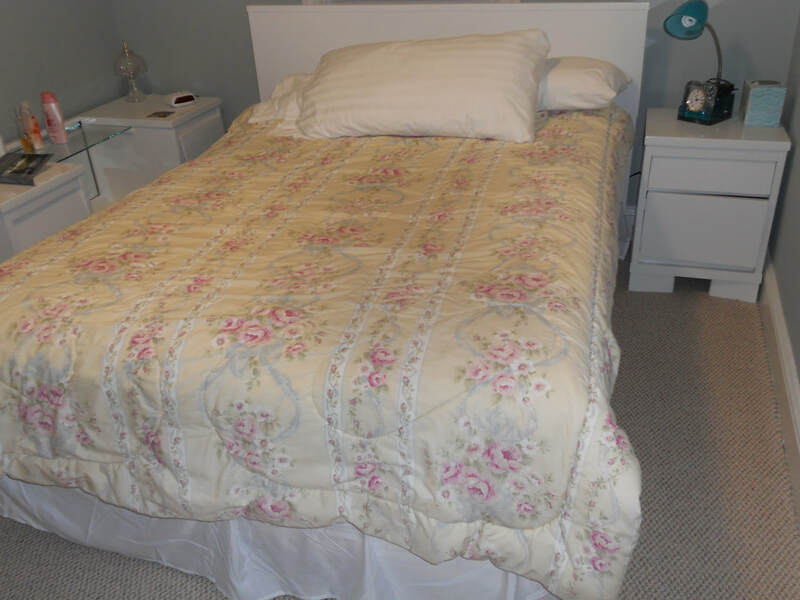 I painted the wood white like the rest of the bedroom furniture, and then I painted the old fabric because I didn't feel like taking it off and starting over. 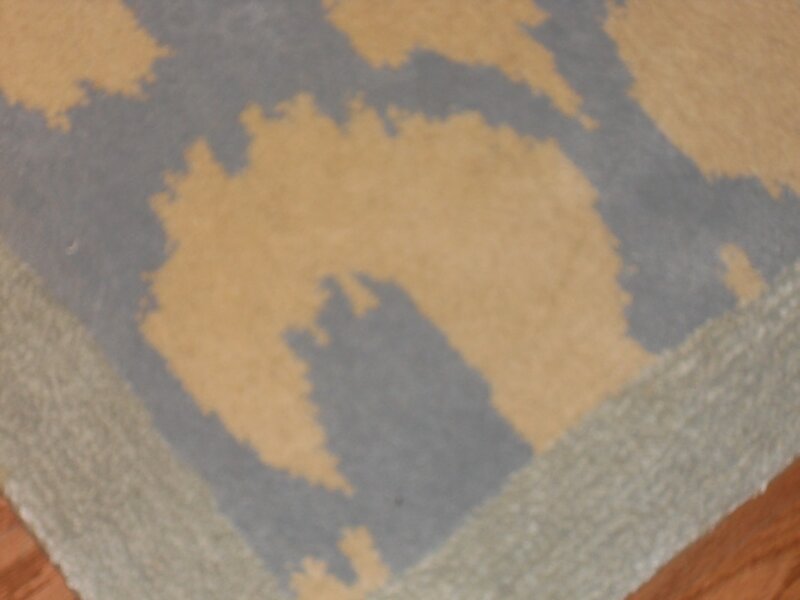 This piece is going to be covered with a white, fake fur throw to give it a 30's glam look. I still need to get a photo of my pretty coral desk. It's in a very awkward place in my garage, not very suitable for photos, but I'll see what I can do. It's also quite heavy to move! Lots of progress was made on the house while I was gone, but nothing that really lends itself to exciting photos. 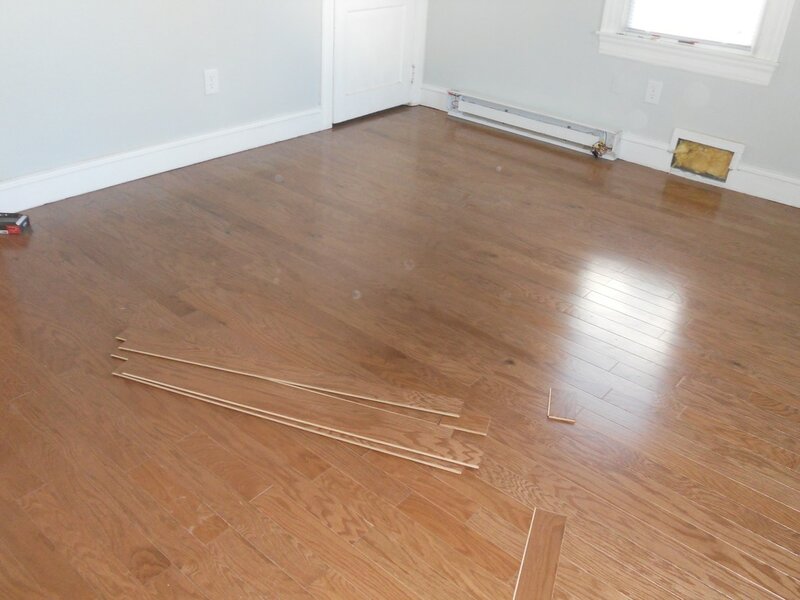 We did start laying down the floor yesterday and will soon have photos of that for you. I also have a few more furniture items I'd like to paint before I get all involved in packing, but we'll see how that goes. The dining table is the main thing and two dressers that could be painted later, as well, but I'd rather not. We'll see how much help Jim needs from me on the floor laying.